Boecraft Skeeter, B Class, side by side 2 seater , 24'wooden mast, 18'runner plank, runners, sail, battens, 3 interior cushions and complete like new covers. Very well cared for and used little. Stored for 6 years inside. Located on Lake Minnetonka, Mn. 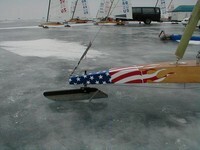 Photo available on www.iceboating.org See the"buy and sell shop" for 12/02/03 on The Four Lakes Ice Yacht Club website. The boat is also featured on Twin City Event Calendar for 2004 for January. Note correct website both iceboats can be viewed on: www.iceboat.org under "buy and sell shop" posted 12/02/03.